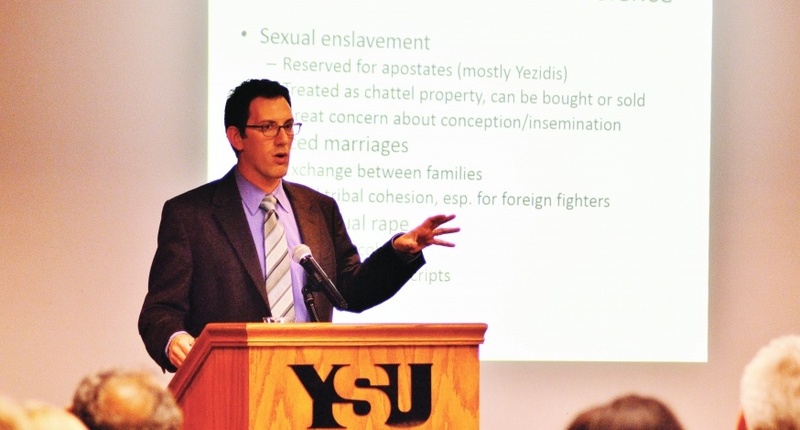 Ariel Ahram, a professor at Virginia Tech University, gave a speech on state-militias at Youngstown State University Monday. Ahram was drawn to studying Iraq as an undergraduate in the mid ‘90s after having two Iraqi professors. His speech focused on the formation of state-militias. This has been a topic at the center of debate in America given the U.S. military’s involvement in the Middle East and the problems caused by state-militias like the Islamic State. “Why is this going on in places like northern Iraq and northeastern Syria? Well the answer I think goes back to thinking about how these communities were created at the end of the Ottoman Empire,” Ahram said. Ahram said he is intrigued by the passage of time in these countries. “I am interested also in what happens to people when states go away, when there is no higher political authority,” Ahram said. He said there are two important features of the Islamic State: they reject all natural borders that divide Muslim communities and they arrived in a period of civil war, which they instigate. He said the division between different religions in Iraq is new. “It was not at all uncommon to have Muslims, Christians and Jews all going to the same shrines and worshipping the same saints,” Ahram said. His speech focused on this and also the effects these places have had on women. Helene Sinnreich, the director of the Center for Judaic and Holocaust Studies at YSU, said this is one of the main reasons she asked Ahram to come speak on campus. Sinnreich said she wanted YSU students to understand what was happening over in the Middle East. “I was very struck by the plight of the women being targeted by ISIS and being forced into slavery. 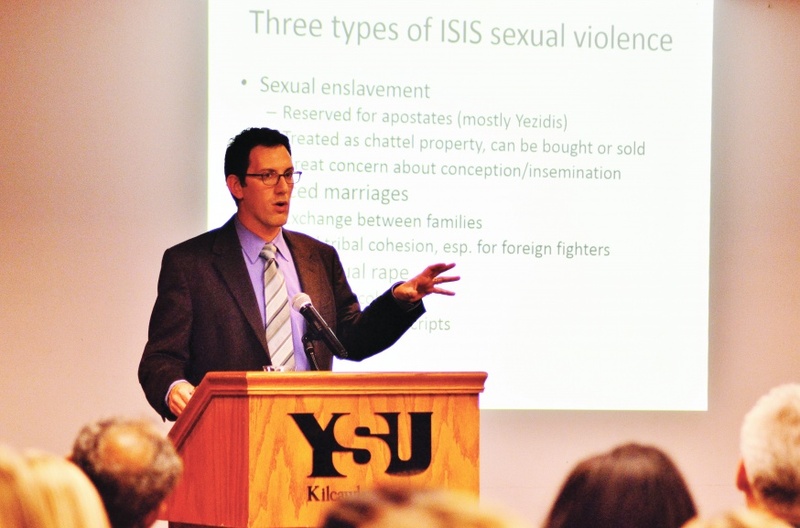 I invited Ariel Ahram to speak at YSU because I thought it was important that the campus — myself included — learn more about this ongoing atrocity,” Sinnreich said. Ahram teaches a lot of courses relating to international security, Middle Eastern politics and social movements — many of his students are active or former military with very direct experiences relating to the topics at hand. Additional reporting by Scott Williams.